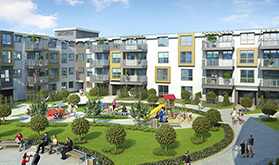 The Aura Gardens project is located in the Bialoleka quarter, one of the most promising quarters in the Warsaw district. Bialoleka is situated on the eastern bank of the Vistula river and is the most dynamically developing area in Warsaw. In addition, the area has great potential for developement due to the northen bridge which has been completed, that connects the area to the city center. The undisputed advantage of Aura Gardens is its proximity to Lake Zegrze - a prime spot for weekend getaways. Aura Gardens project includes 360 units in four stages, expanding on 29,540 square meters. Construction of stage A (around 110 units) was completed. Construction of stage B (around 110 units) is expected to be completed during 2019. Construction of stage C and D (around 160 units) is expected to begin during 2021.